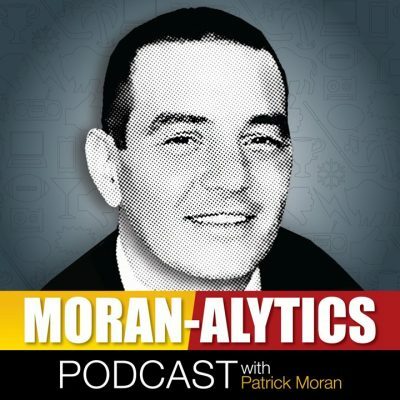 The Moran-Alytics Podcast enjoys its biggest score to date as Patrick Moran interviews long-time Sports Illustrated veteran and current media critic and columnist for The Athletic, Richard Deitsch. Starting at around the 3:30 mark Richard discusses in detail several topics, including why he decided to leave Sports Illustrated after 20 years for The Athletic, why he will soon be relocating permanently to Toronto, how he really feels about Skip Bayless, recollections of his favorite Olympic memories (he’s covered seven Olympic games) and Richard reveals why he chose to Buffalo for his college education and how going to school there played a role in launching his widely successful sports media career. We also discuss his Sports Media podcast, which has long been one of the top ranked sports and recreational podcasts in the world and Richard shares memories of a few past guests and offers his take on what makes for a good show. Lastly, Patrick asks Richard a series of rapid-fire style questions and actually stumps him when Richard’s asked what three dinner guests he’d most like to have, dead or alive. After that Patrick grabs Tone Pucks (@tonepucks) for the Monday weekly “Pat with Pucks” segment. This week they are giving their final thoughts as the NFL draft begins just four day from now. They also react to the Benjamin Allbright interview from last Thursday, give their takes on the NFL schedule release and offer opinions on now retired former Buffalo Bills running back Fred Jackson.